FDR and Polio, Howard Hughes Medical Institute. Franklin D. Roosevelt Library and Museum, Marist College. Franklin D. Roosevelt's Visits to Georgia, University of Georgia. Franklin Delano Roosevelt Memorial: K-12 TLC Guide. Franklin Delano Roosevelt's Grave, Find A Grave. The Franklin and Eleanor Roosevelt Institute. The North Shore Country Day School, IL. Franklin Roosevelt Presidential Library and Museum. Eleanor Roosevelt and the Tuskegee Airmen. Eleanor Roosevelt: American First Lady & Humanitarian, Lucid Library. Eleanor Roosevelt National Historic Site, The National Park Service. State of the Union Addresses. Miami, Florida: K-12 TLC Guide. 10/01/1937: FDR Visits Washington's Olympic Penninsula, HistoryLink. FDR Puts the Great Seal on the One-Dollar Bill: 1935, The Great Seal of the United States of America. The Four Freedoms, At Home and Abroad. Franklin Delano Roosevelt Memorial, National Park Service. Harlan Fiske Stone's Footnote #4 (1938): K-12 TLC Guide. 02/15/1933: Chicago Mayor Killed in Miami by Bullet Meant for FDR. 02/15/1935: Congress Approves FDR's Civil Works Emergency Relief Act. 02/16/1938: Agriculture Adjustment Act Becomes Law. 08/28/1941: FDR Issues Executive Order Creating the Office of Price Administration. 01/06/1942: FDR Commits to 45,000 Aircraft & 45,000 Tanks within a Year. 1945 Nobel Prize for Peace, The Nobel Foundation. 10/23/1941: Senate Passes $5.98B Lend-Lease Bill. Bad Boy Presidents (audio: 3:22). FDR's Losing Battle to Pack the Supreme Court. When the Bankers Plotted yo Overthrow FDR. William Dodd: The U.S. Ambassador in Hitler's Berlin. 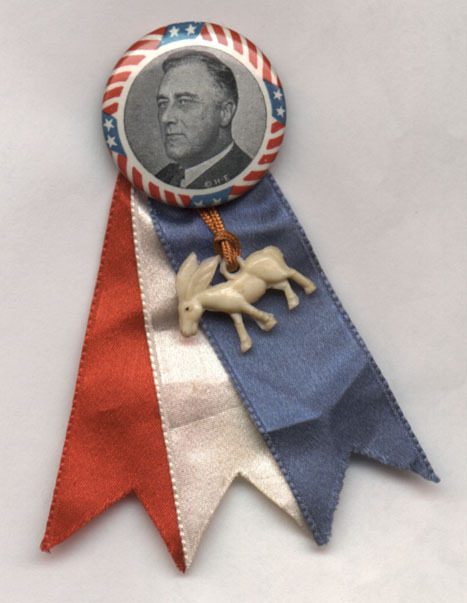 11/03/1936: Roosevelt Re-elected in Landslide over Republican "Alf" Landon. 11/26/1942: Roosevelt Orders Gas Rationing to Begin December 1. Roosevelt's Tree Army: Civilian Conservation Corps, Michigan Historical Center. Visit to Houston: 1936, Historic Fair Park. State of the Union Addresses: K-12 TLC Guide. Setting FDR's Words to Music. Papers of Franklin Roosevelt, University of California Santa Barbara. Robert Trout Coins the Phrase: 11/14/00 (8:00). 1940 Address at Charlottesville, U.S. Secretary of State. Franklin & Eleanor Roosevelt Institute. 12/07/1941: "A Date Which Will Live in Infamy". US History Out Loud (audio), Houghton Mifflin Company. Improving Great Speeches (satire): 10/4/00 (2:15). Recalling Past Inaugurations: 01/14/01 (10:00). Second Inaugural Address, January 20, 1937. Project Bartleby Archive, Columbia University. Michigan State University (audio: 1:10). 11/08/1933: Roosevelt Introduces the CWA. 08/29/1935: FDR's Wealth Tax Act Passed into Law. 11/15/1939: FDR Lays Cornerstone for Jefferson Memorial. 08/27/1941: Japan's Prime Minister Requests Summit. 01/10/1941: FDR Proposes Lend-Lease Program to Congress. 10/30/1941: FDR Approves Lend-Lease Aid for USSR. 01/14/1943: Casablanca Conference Begins with Churchill. 11/26/1941: 4th Thursday in November Set as Thanksgiving. The Golden Age, Gore Vidal. A Life in the Twentieth Century: Innocent Beginnings..., Arthur Schlesinger Jr..
First Inaugural: Fighting the Great Depression. 1933: Fireside Chat on the Recovery Program. 1941-42: Churchill and FDR Documents.